We have seen that several companies have been taking their time in introducing their own version of a smartwatch. Hopefully, we will finally see one from Apple next month. 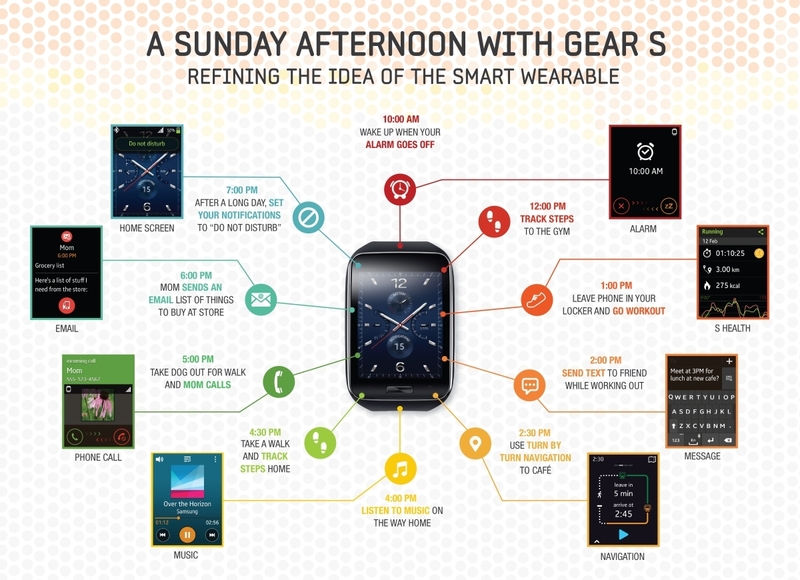 One company, however, that has not been shy about its line of smartwatches is Samsung. Last year, Samsung had the Galaxy Gear already on the market in time for the holiday buying season. Since that time we have seen just how unreserved they are in the world of smartwatches. This is evident by taking into account the Gear 2, Gear 2 Neo and Gear Fit. While all are fairly similar in style and design, the Gear Fit does sport a long thin curved display. Something that all the Samsung Gear devices have in common is the use of a Bluetooth connection. There are several things about this device that will make it different and possibly set it apart from the crowd. Similar to the Gear Fit, the Gear S has a curved Super AMOLED display that measures two inches diagonally with a 360x480 resolution. However, what really does set this device apart is the fact that in addition to the Bluetooth connection, it will also have a built-in Wi-Fi and cellular 3G radio for optional data connectivity. Essentially, this eliminates the need of having to pair this device with a smartphone for Internet access. As you can see from the images below, we cannot be exactly sure how the face will look since these are just release photos, but what you can see is the area on the back where a SIM card will go. Does this mean that you will need to add a new line to your service? The Gear S will have run on Tizen, the same operating system as Gear 2. Some of the features of Tizen include that it is open source, an HMTL5-based OS, it will run and offer a unified experience across multiple devices and support native and Web apps. A good question would be to see if Samsung is using Tizen to be independent. On the software side, the Gear S will have Samsung's own S Health app preloaded along with Nike+ Running software, indicating that it is possibly aiming to occupy a position somewhere between the fitness-oriented Fit and its more versatile Gear 2 and Android Wear offerings. Nokia's Here maps will be used for pedestrian turn-by-turn navigation on the watch, as well as Spritz speed-reading, which marks another departure from the Google software stable. If you want to know the specs for the Gear S, you can expect to see it packing 4GB of internal storage, along with 512MB of RAM, plus a dual-core 1.0 GHz processor. It has IP67 dust and water resistance. This rating means that it is totally protected against dust and is waterproof to a depth of a little over three feet for about 30 minutes. It contains a relatively small 300mAh battery, which Samsung says will still manage to give the device 2 days of usage under normal conditions. This next-generation smartwatch is described as having a “chic, circular design” with customizable screen options, changeable straps and several wearable optimized features, including widgets and combined notification boards. It is possible that we will get our official first look at the Gear S next week at the Berlin IFA Conference. The Gear S will be available starting sometime in October, though we do not know what the pricing structure will be as it has not been announced. Regardless of the price, there are a couple of things to consider. First, since Samsung has quite the variety of smartwatches available, are consumers looking for a new model? Second, since Samsung seems to be moving its wearable devices to the Tizen OS, how will this fair against Google who has thrown its weight behind Android Wear? This should be an interesting holiday shopping season.